I don't know about you, but the gradually lighter mornings and evenings put me in such a good mood. Maybe it's the fact that it's not dark when I go to work and dark when I finish anymore, but the start of Spring has inspired me in more than one way this year, makeup included. Here's a few products that I've been using to get the fresh-faced, radiant look. The NARS Pure Radiant Tinted Moisturiser is something I didn't initially get along with. Even with £10 off, I was disappointed at the lack of coverage it offered for the price and I was genuinely confused as to why everyone raves about this. Enter the Real Techniques Expert Face Brush. Using a stippling brush, the tinted moisturiser didn't cover much of my redness at all without applying layer after layer. But the Expert Face Brush gives it slightly more coverage and a much more even finish. This will definitely be coming to Florida with me in May! I've been switching between two blushers over the past few weeks. First up is the Bobbi Brown Powder Blush in Nectar. A matte peachy pink that will look flattering on most skin tones, Nectar is definitely one of my favourites to brighten the cheeks without overdoing it. My other blusher pick is Tarte Exposed. A slightly pinker alternative to NARS Douceur, Exposed is great for giving a natural flush to the skin. It's incredibly pigmented though, so a light hand is needed. The Rimmel Wake Me Up Concealer was added to my collection after Sam sung it's praises. I have pretty dark circles under my eyes but the slight shimmer in this works to brighten and illuminate without the heaviness. Definitely my favourite concealer for under the eyes. My most recent purchase is the L'Oreal L'Extraordinaire Liquid Lipstick in Molto Mauve. A lipstick/lipgloss hybrid, these new lip offerings from L'Oreal give a buttery soft sheen of a lipgloss combined with the pigmentation of a lipstick. The formula feels similar to the NYX Butter Glosses. I tend to prefer deeper coloured lip products however Molto Mauve does a great job of looking natural without washing me out. I wish I'd taken advantage of the 3 for 2 offer when I bought this! 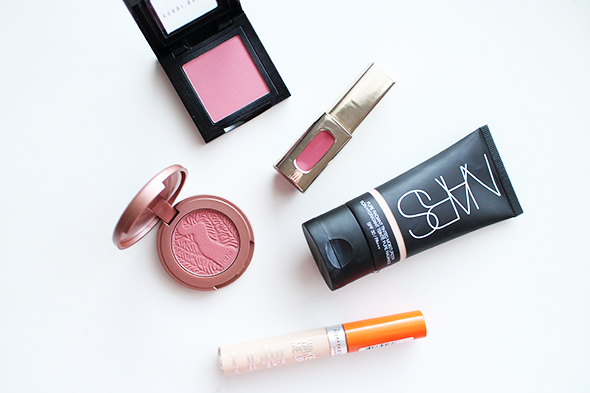 What are your picks for radiant, Spring-ready makeup? These all look so amazing for spring! I love your Tarte blush it looks amazing! I really want some of the L'Oreal liquid lipsticks, they look so lovely! Love the Tarte blush too, such a beautiful colour. Can I ask where you got £10 off the NARS tinted moisturiser? I can't find anything else I like as much! Also love the Rimmel concealer, it's really nice for under the eyes. It was a £10 voucher I got for John Lewis through Valued Opinions, the survey site. It just goes to show how much of a difference how you apply a product can make! I can't wait for the L'oreal glosses to land, they sound really great and I've been on a serious gloss kick lately. Love Wake Me Up concealer! I also need to pick up that Tarte blush! I like the Wake Me Up Concealer as well! It's so great for dark circles! I'm definitely in more good moods now that it's summer, I love dressing for summer and the make up looks become so much lighter and prettier! I have Tarte Exposed as well, and it is my absolute favorite blush! The neutral color is easy to wear throughout the year, and the pigmentation is incredible.